Extra low power, all your inputs for less than 0,5W ! The KNX input gateway is used to connect several input devices to the KNX bus through a single KNX interface. It is fully integrated in the KNX network by using the standard KNX cable for all its devices. Therefore, combining KNX and ELAUSYS devices on a single cable. 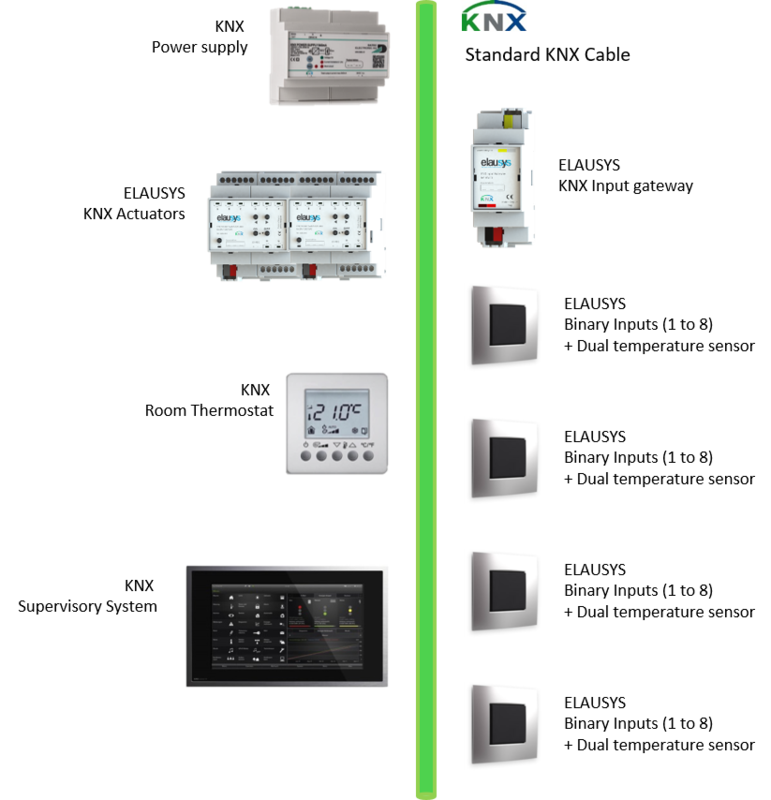 Up to 60 binary inputs and 30 sensors can be configured in the gateway and are fully compatible with all regular KNX functions. Using the input gateway is the most effective solution to integrates several inputs into a KNX installation while keeping all the flexibility and advantages of KNX. The gateway housing is made to be installed on a DIN rail. Moreover, binary input devices have an internal temperature sensor and an input for an external temperature probe. Versions are available in 1, 2, 4, 6 or 8 binary inputs to fit exactly to your need. The KNX input gateway fully integrates in a regular KNX network. With its single line topology and the use of spare wires in the standard KNX cable, both buses can work in parallel. 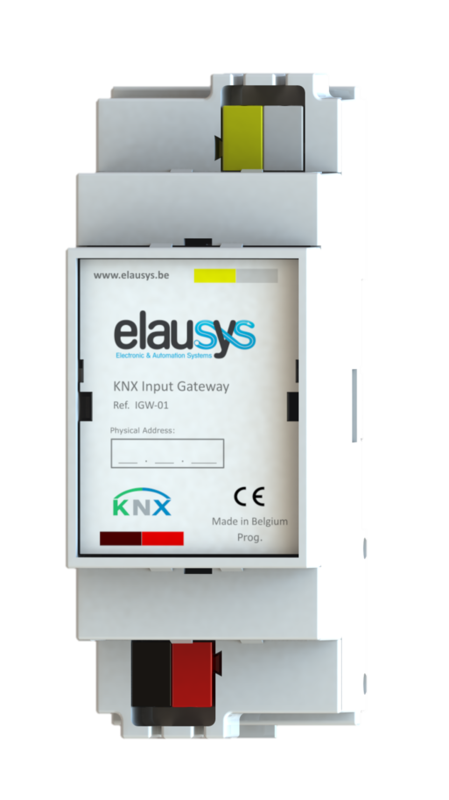 KNX bus is accessible at any devices, therefore KNX and ELAUSYS devices are easily interchangeable. The gateway is connected to the KNX bus using the regular red and black wires, the yellow and white wires are used for the ELAUNET bus. 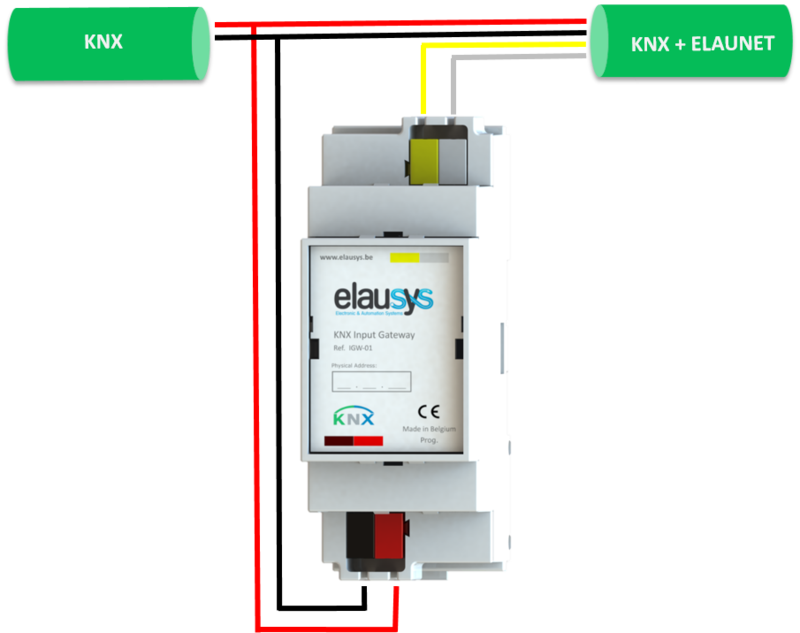 ELAUSYS devices are connected using the four wires of the standard KNX cable.